Swales, marshes, swamps, borders of vernal pools and wet depressions in forests, very local. 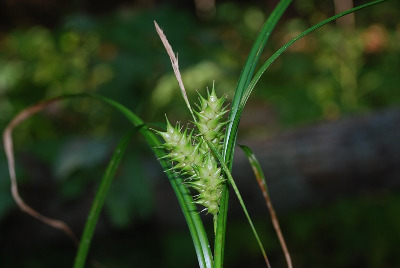 The achenes of Carex lupuliformis when slightly immature may be distinctly longer than wide, but such plants can generally be distinguished from C. lupulina by the very prominent knobs of the angles of the achene, and sometimes the often long ± loosely flowered spikes with more widely spreading perigynia. Mature, well-developed achenes of Carex lupuliformis taper somewhat concavely from the style base to the widest point, while those of C. lupulina are cuneately or even slightly convexly tapered. MICHIGAN FLORA ONLINE. A. A. Reznicek, E. G. Voss, & B. S. Walters. February 2011. University of Michigan. Web. April 19, 2019. https://michiganflora.net/species.aspx?id=1001.